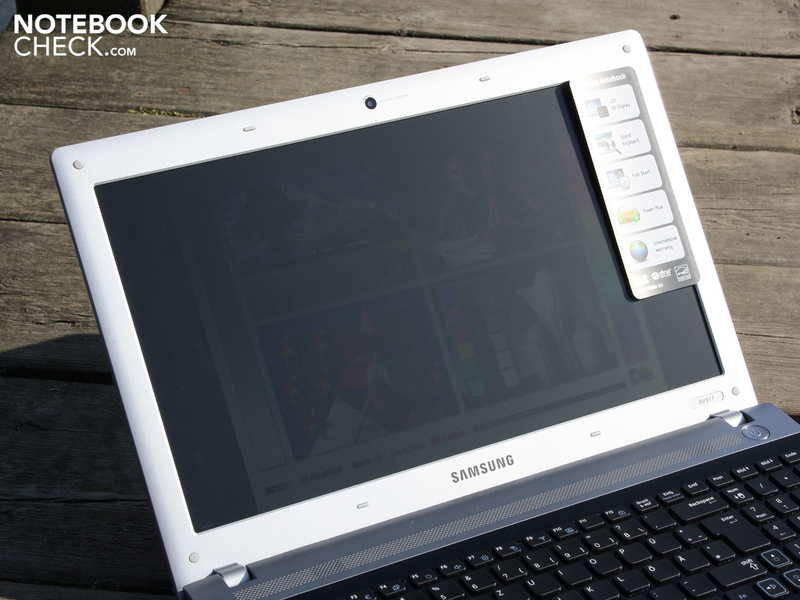 Goodbye Glare-Type Samsung is shying away from glare-type screens and has equipped this well-rounded office notebook with a matte (and still bright) display. 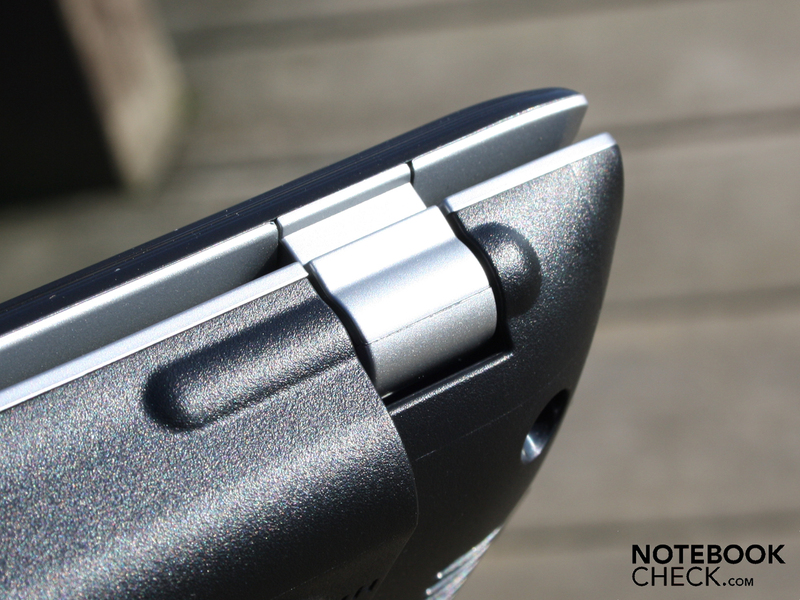 Check out the "Display" section of the review to see how the matte screen differs from a glossy one. 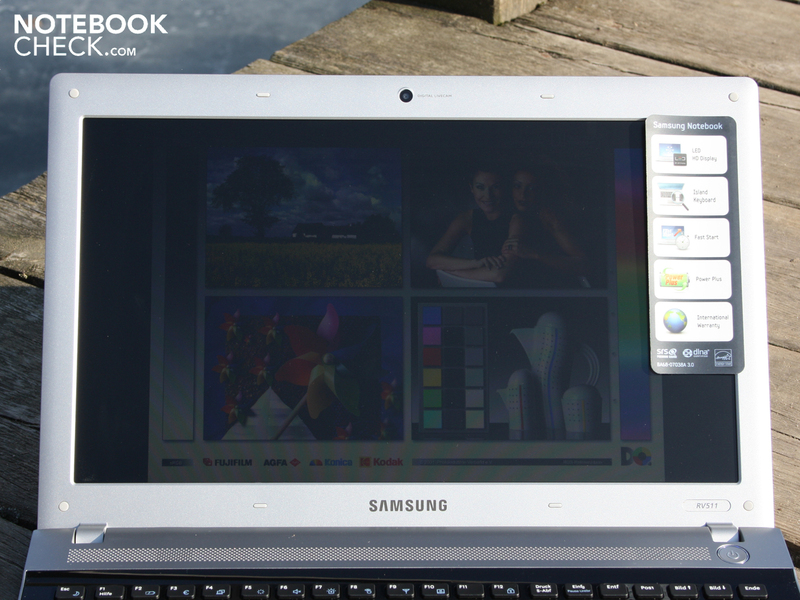 Samsung has heard the cry of the masses,that is, for matte notebook displays. 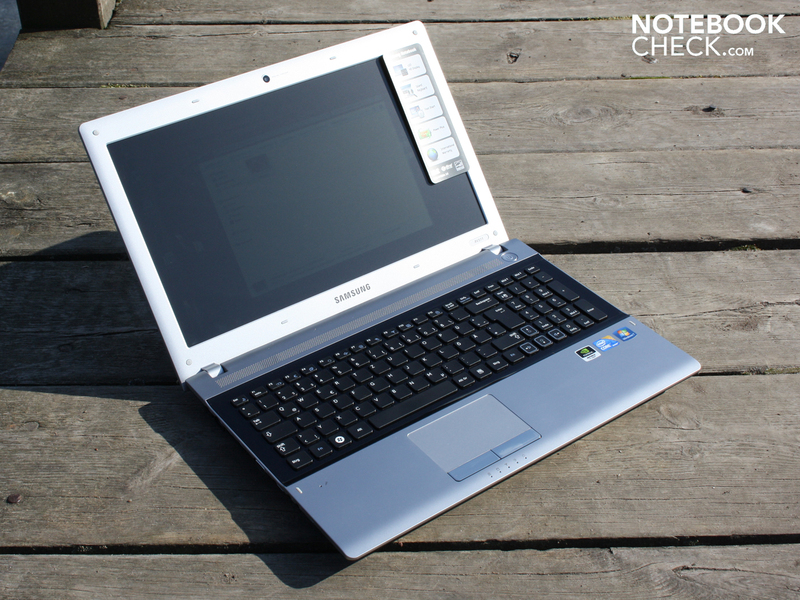 The manufacturer has boldly equipped a notebook outside the netbook, office or premium category with a non-reflective display. 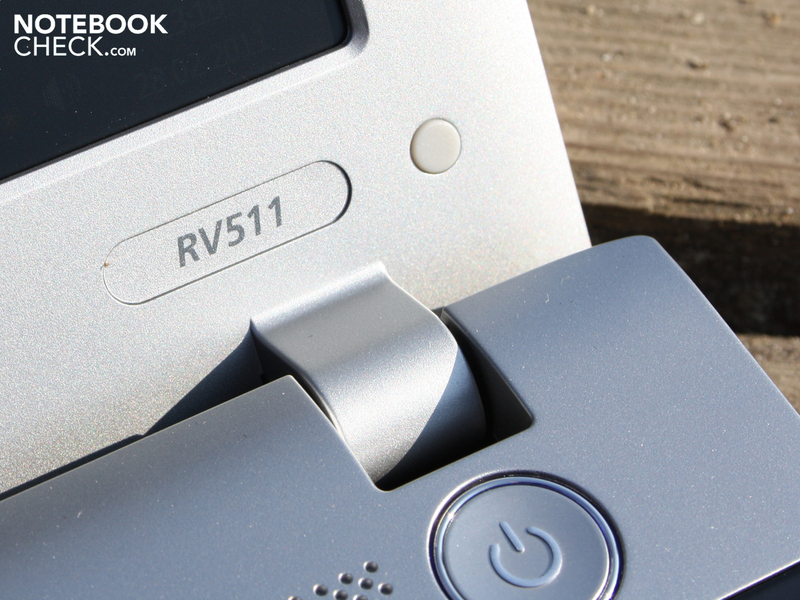 The RV511 is supposedly a "fully capable starter notebook". Although its price of 520 Euro falls in among that of bargain notebooks, the hardware within should provide for smooth performance. Our test model came with a Core i3-380M and GeForce 315M. This makes it identical to the recently reviewed RC510 in terms of hardware. So that this 15.6" laptop doesn't drown in a sea of virtually indistinguishable notebooks, Samsung has gone with quite a unique case design. The screen in place is a matte SuperBright LED display. But is this screen good enough to combat the irritating effect of direct sunlight? Find out below. The craftsmanship of the Samsung RV511's case is not of the highest quality. The case is not incredibly sturdy. Holding the base unit with two hands, we were able to noticeably twist it. We were also able to dent the base plate toward the left and right. As is so often the case, the area covering the DVD drive is the weak point. The display lid hinges hold the screen up tight, but don't always keep it from bobbing back and forth. Opening up the laptop takes two hands. 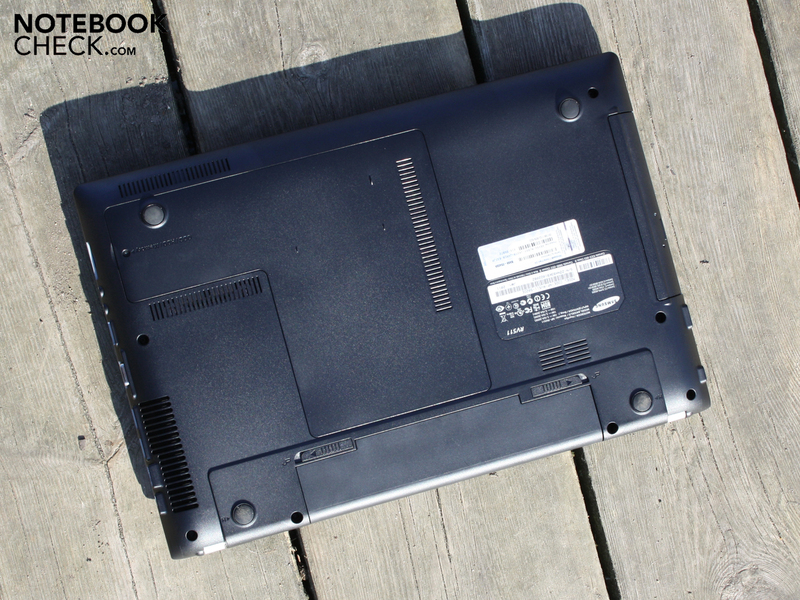 The laptop stays shut when closed, never opening up more than 2 cm when carried. The lid can tilts back a decent 140 degrees. The silver surface on the inside is indeed matte but not safe from scratch marks because of its finish. The silver-and-black thinly grooved surface doesn't show any fingerprint marks and is easy to hold thanks to its non-slip texture. 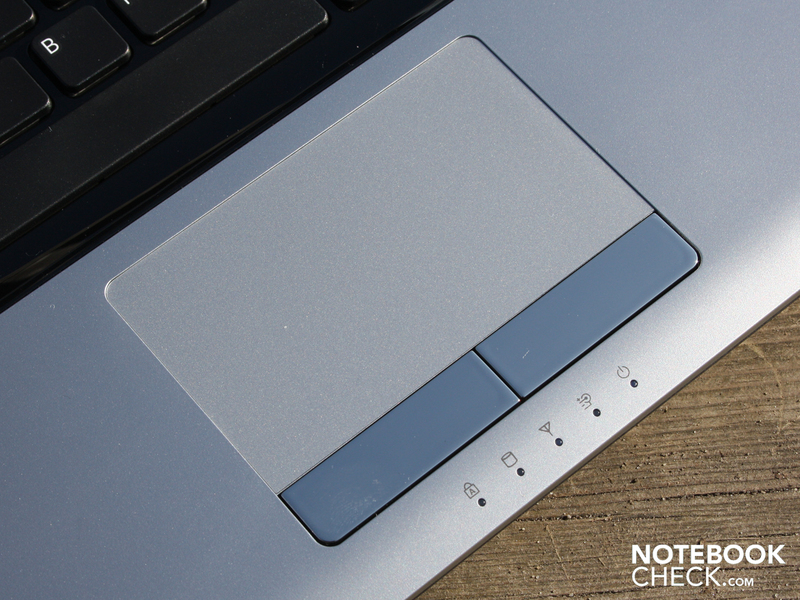 Few of the RV511's surfaces are reflective, but the area around the keyboard is quite glossy. Black high-gloss plastic encompasses the individual chiclet keys and makes a snazzy impression until you try to use it. The area between, below, and to the side of the keys gathers dust and fingerprint marks. Considering this, we don't much hesitate to say that this area will soon be covered in scratch marks. 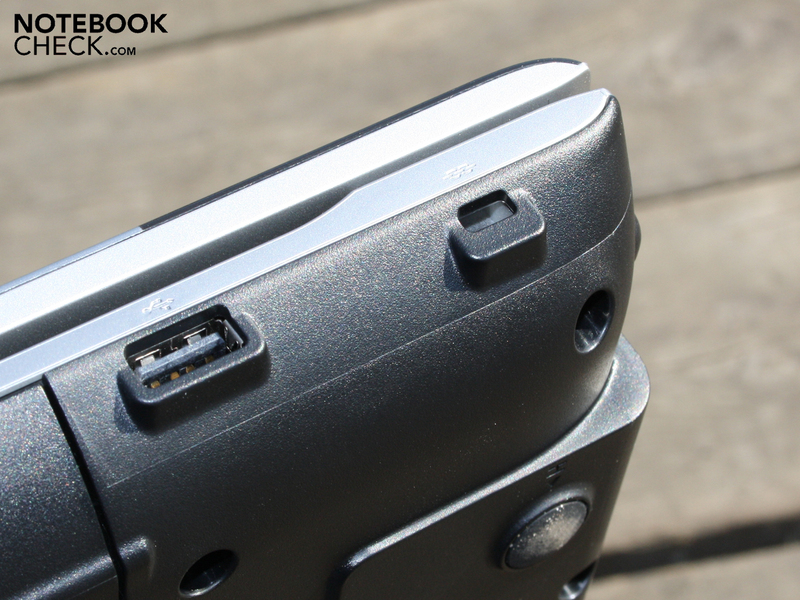 Other than a lone USB 2.0 port, the ports are all bundled together on the left side. 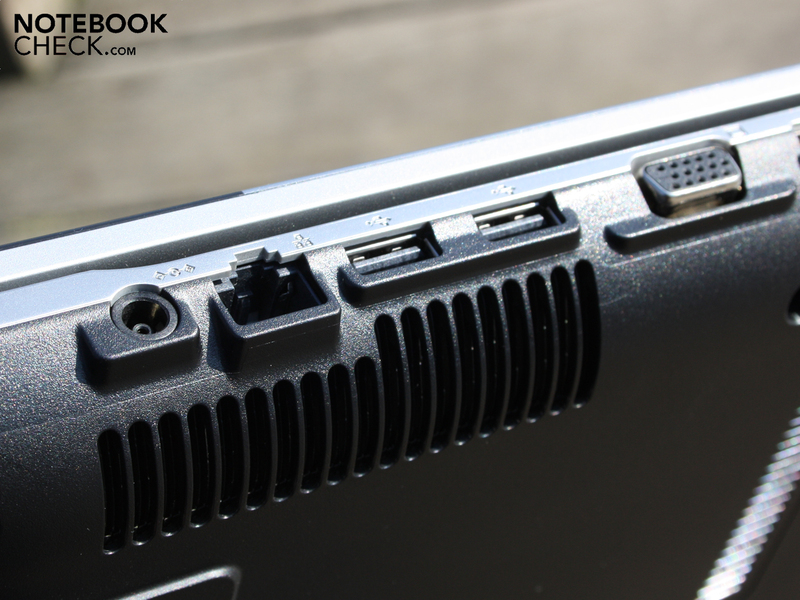 Next to the power connector, you'll find the VGA (D-Sub) port, two USB ports, an Ethernet port, a headphone jack, a microphone input and an HDMI port. The SD card reader is also found at the left. The positions of these ports is quite appropriate. As is often the case, there are no ports at the back. Still, the single USB 2.0 port at the right is found all the way toward the back. The bulky VGA, power and Ethernet cables at the left are all located further back. Right: DVD Drive, USB 2.0, Kensington-Lock. 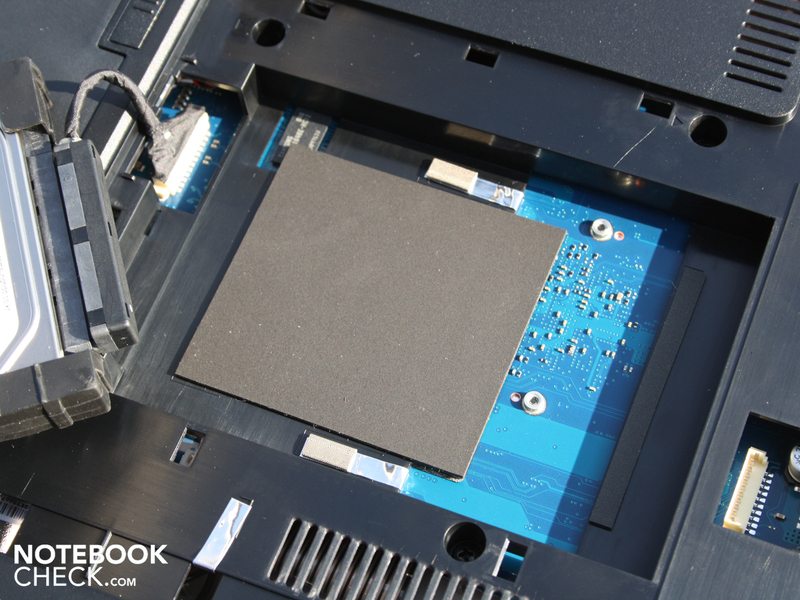 In addition to the Draft-N Wifi (Atheros AR9285), the notebook also comes with Bluetooth. The Realtek PCIe GBE Family Controller (Ethernet) can transfer data a gigabits per second within the LAN. 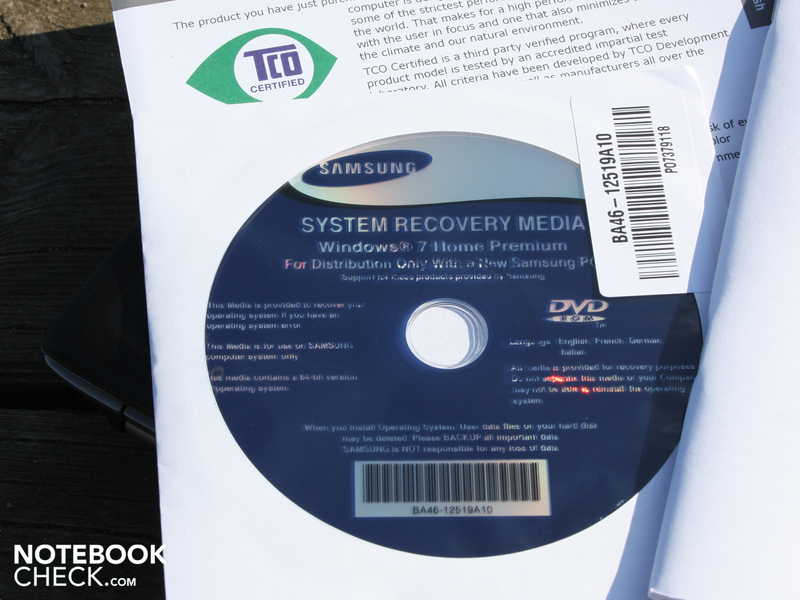 Samsung has thrown in a recovery DVD for Windows 7 Home Premium (64Bit) as part of the package. 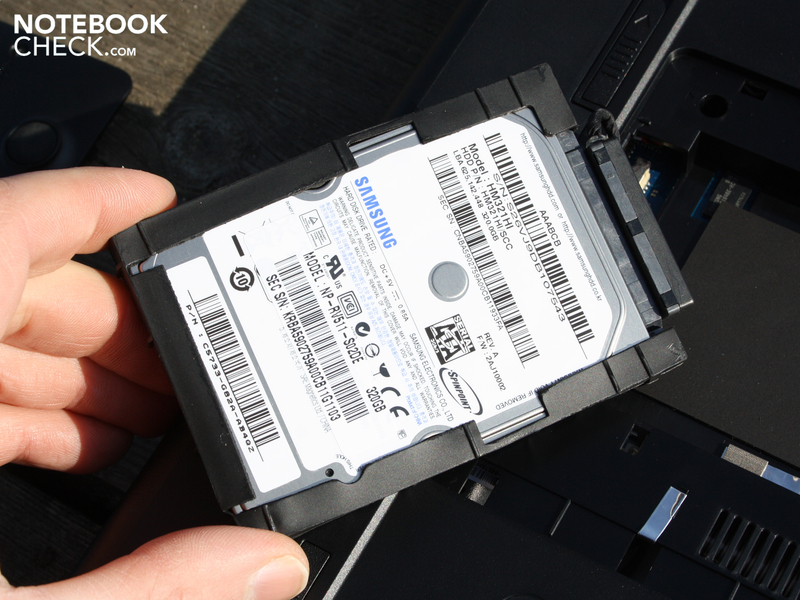 You can, of course, still use Samsung's Recovery Solution to burn your own back-ups. Among the various software Samsung provides are EasyMigration (data transfer), PhoneShare (sharing files between computer and cell phone via internet), Easy File Share (access your data from other PCs), Easy Network Manager (Wifi locations) and Update Plus (driver updates). 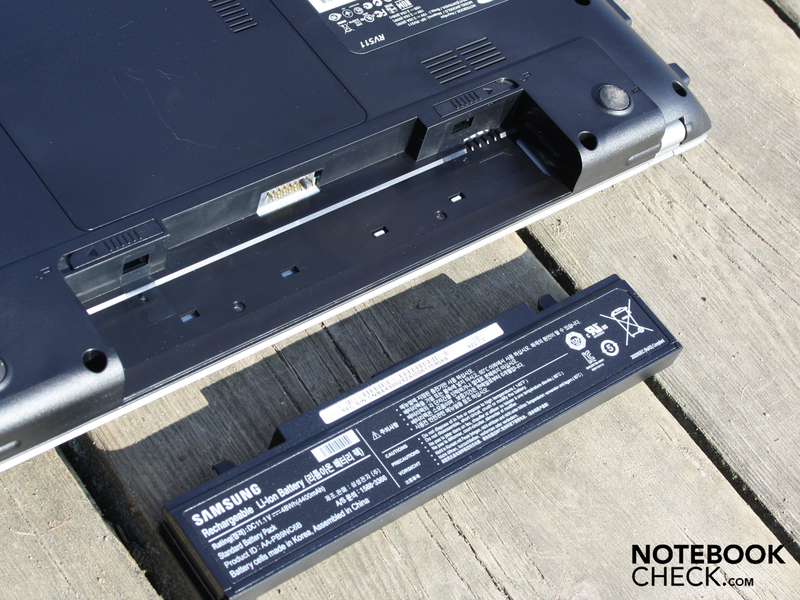 The Battery Life Extender sets the maximum battery charge to 80%, which keeps the battery life long over the life of the notebook. The Easy Speed-Up Manager (Fn+F8) cleans up the registry. The manufacturer's warranty lasts 24 months (including on-site repair). The extended warranty costs an additional 50 Euro and gives a total of 3 years of on-site repair coverage. 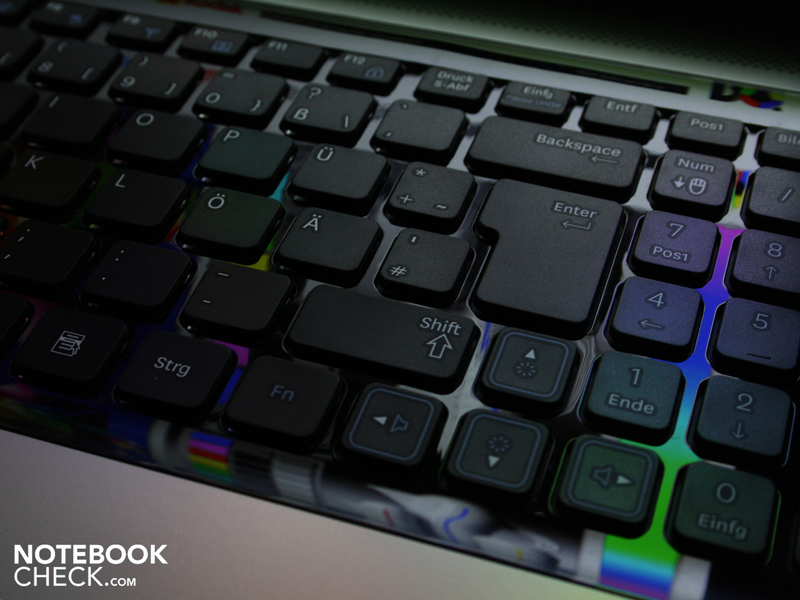 The individual chiclet keys are nestled in a high-gloss plastic surface. When keys are pressed they lie evenly with their surrounding glossy base, making cleaning easy. Those big typers among us will like the big palm rest with place even for the largest of hands. The keys on the dedicated number pad are smaller than the rest. 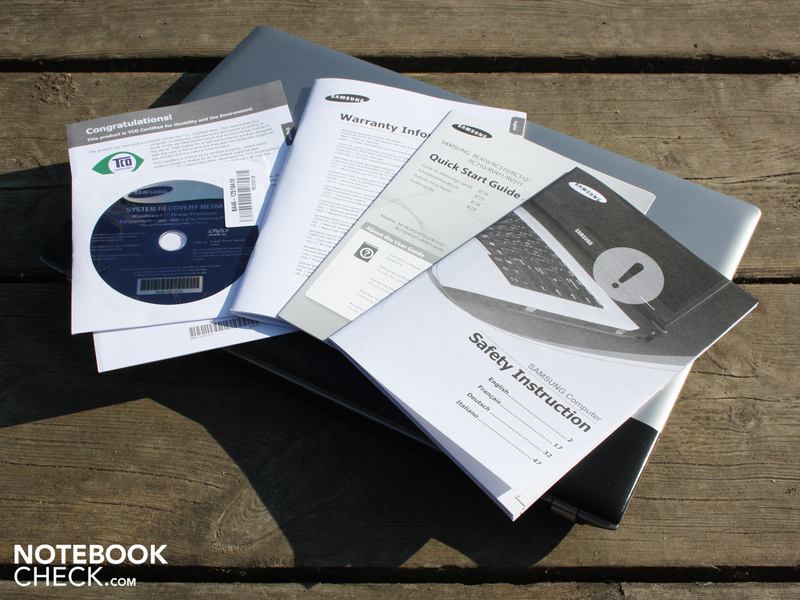 Samsung has, however, kept he standard layout with the "Enter" and "." keys to the right . The arrow buttons are squeezed in between the "Shift" key and the number pad. But they can be distinguished by their blue borders. Of course, hitting another key when aiming for an arrow key does occur from time to time. We were able to type quite confidently, hitting the aimed-for keys. The key depression depth is moderate and the keytrokes firm (but not hard). The key bed sits firmly in place. However, the pressure that needs to be applied so that the computer recognizes keystrokes is not very easy to feel when typing, which makes for occasional missed keystrokes. What's more, the absolutely flat keys make it easy to hit the wrong one every now and then. (A way to alleviate this would be to have the borders of the keys slightly arched downward). 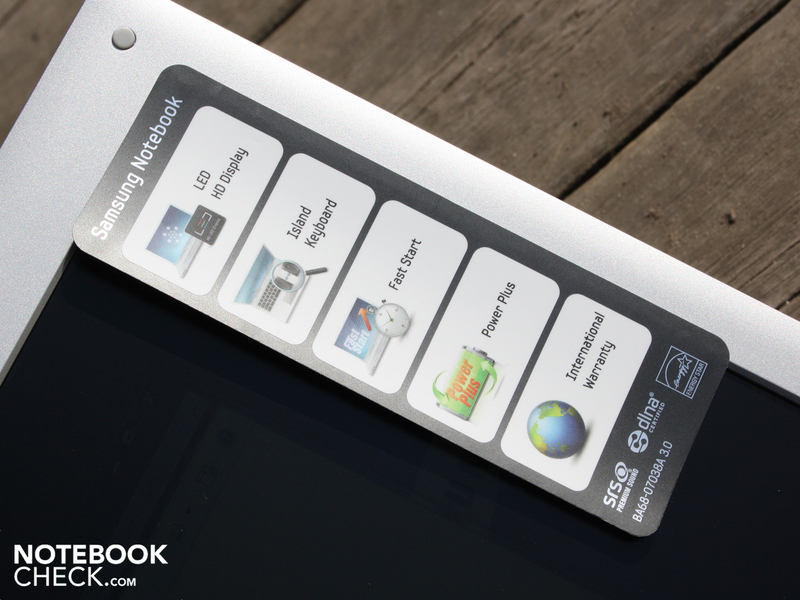 This multi-touch pad (Elan Smart Pad) responds to touch anywhere on its surface, from the center all the way to the edges. It also has two unmarked scroll bars (vertical & horizontal). 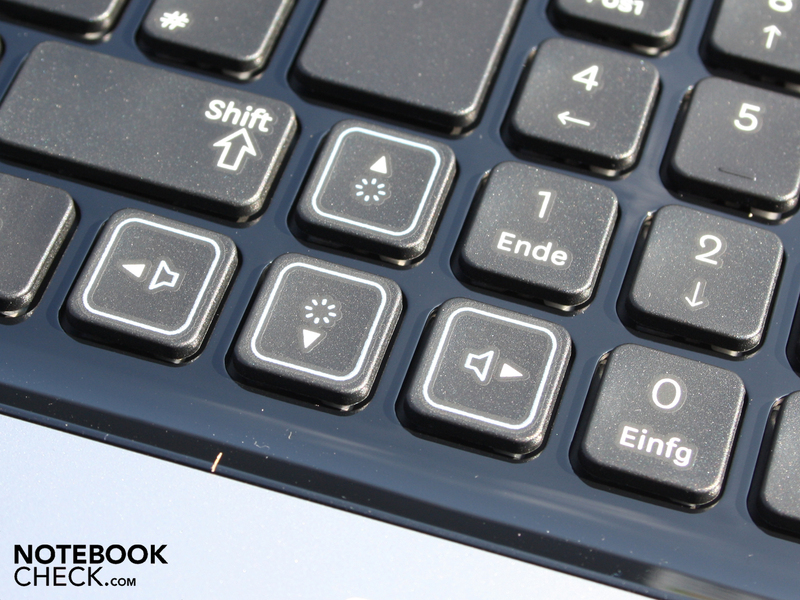 Those who would like to use the entire touchpad surface just for directing the cursor can turn the scroll bars off. The surface is matte and rather smooth. 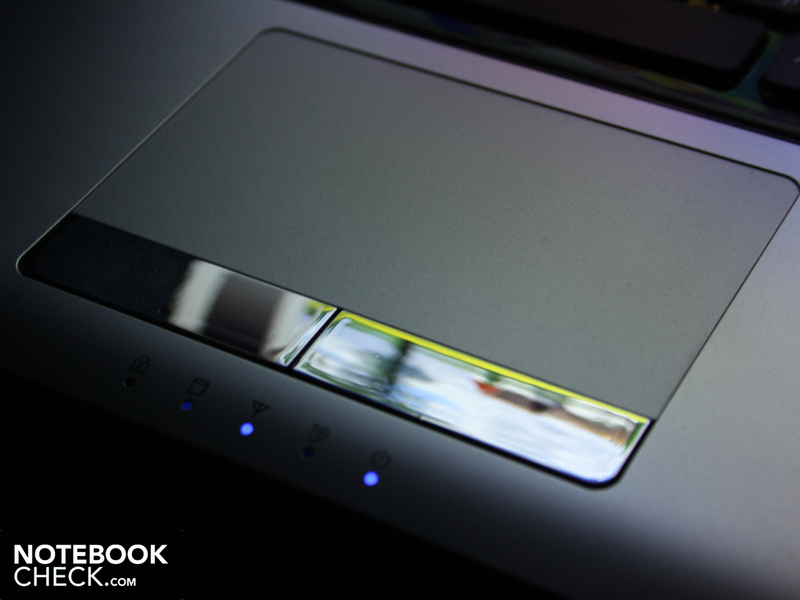 The touchpad quickly responds to multi-finger gestures like rotating, scrolling and zooming. 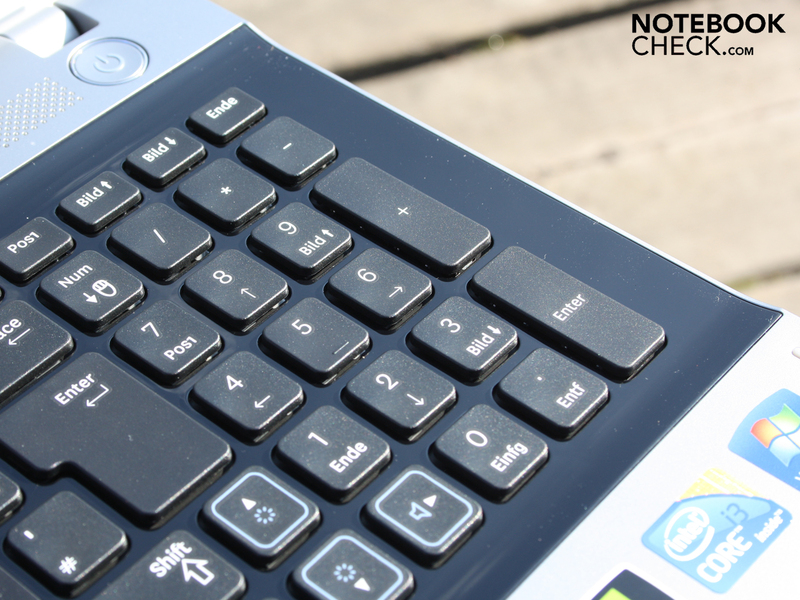 The touchpad keys' moderate depression depth and effortless clicking makes quick navigation a breeze. The loud clicking can become irritating after a while. Samsung has put in place here a WXGA display (model: Samsung LTN154X3_L01), the same one as in the expensive RF510 and the RC510. It has a resolution of 1,366 x 768 pixels and is non-reflective. This is perfect for use in the office and sometimes even outdoors. The screen contrast is, however, very low at 120:1. 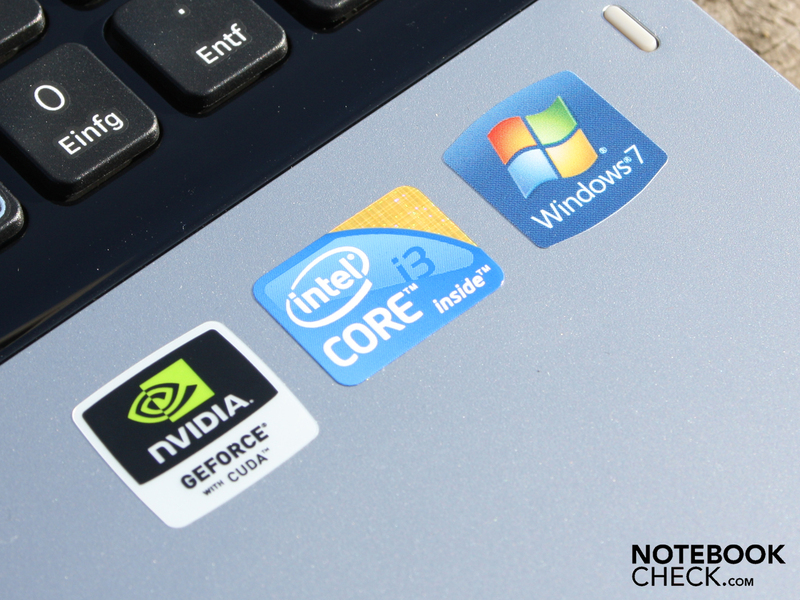 This is typical for office and multimedia notebooks in the low and mid price range. Jet blacks do no appear so and have a noticeable gray tint to them. As a result, the RV511 is incapable of having a very broad color space. 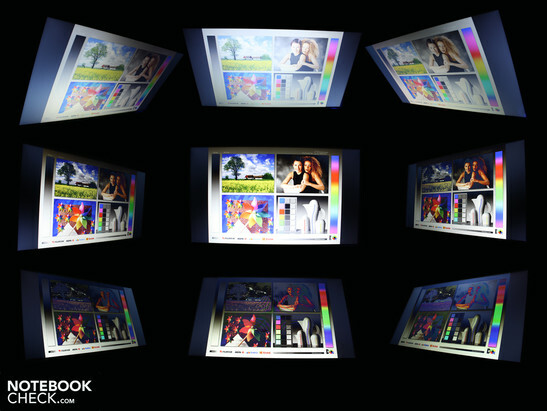 Our display's color space does not nearly approach Adobe RGB 1998 (t) or even sRGB (t). As point of reference, the Vaio EB4X1E (t) image below shows what a good consumer display's color space should look like. 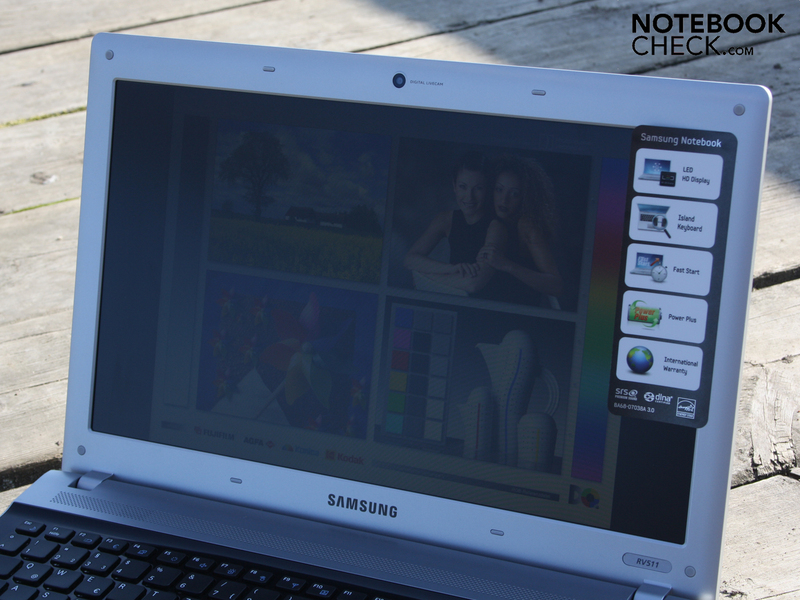 The LCD screen distributes brightness across the screen very evenly: 93%. The difference in brightness between LEDs is very low, the minimum and maximum brightness are a mere 17 cd/m² apart. On top of that, the average screen brightness of 231 cd/m² is really quite good but still not too close to "very good" (300 cd/m²). Because of its high screen brightness, the RV511 remains usable outdoors in direct sunlight. As you can see in our photos, the screen does not appear very bright but thanks to its non-reflective coating, you can still manage to work outdoors. 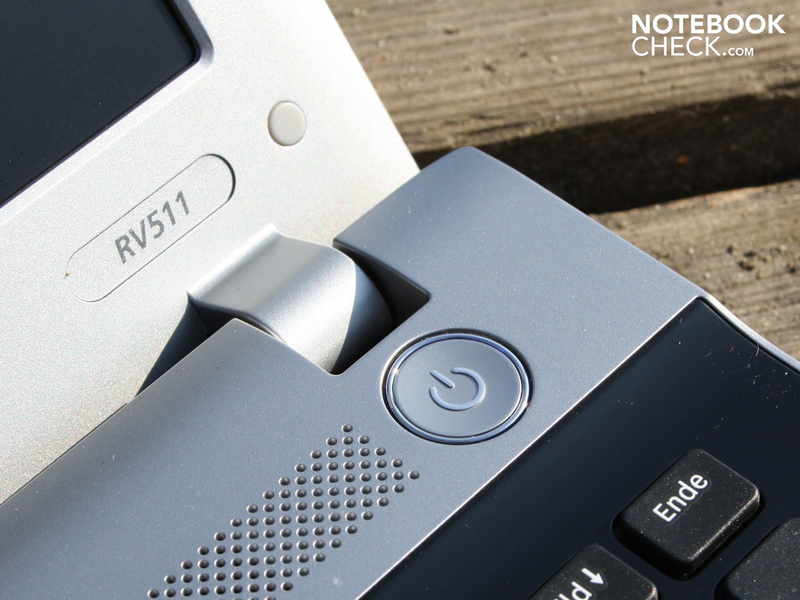 The RV511 has few viewing angles like most office and multimedia notebooks. When tilting the screen back or forth more than 15 degrees (vertical) away from the ideal viewing angle, you start to see a ghost image (a slightly askew image superimposed on the first). Looking at the screen from the left or right (horizontal) the picture remains undistorted for up to 45 degrees away from the straight-ahead viewing angle. Moreover, colors start becoming inverted very quickly outside of this scope. Few panels have better viewing angles and are not available in laptops costing less than 800 Euro. 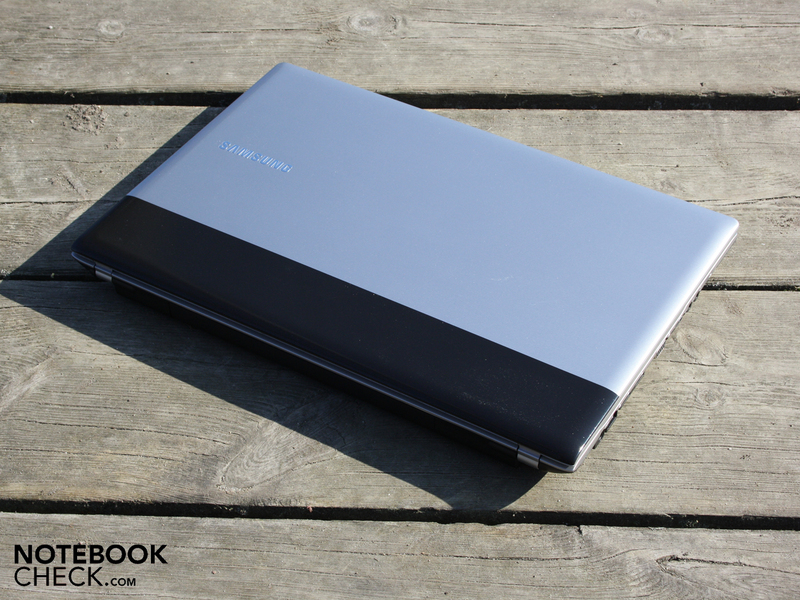 An affordable example would be the Vaio EB4X1E (15.5"). 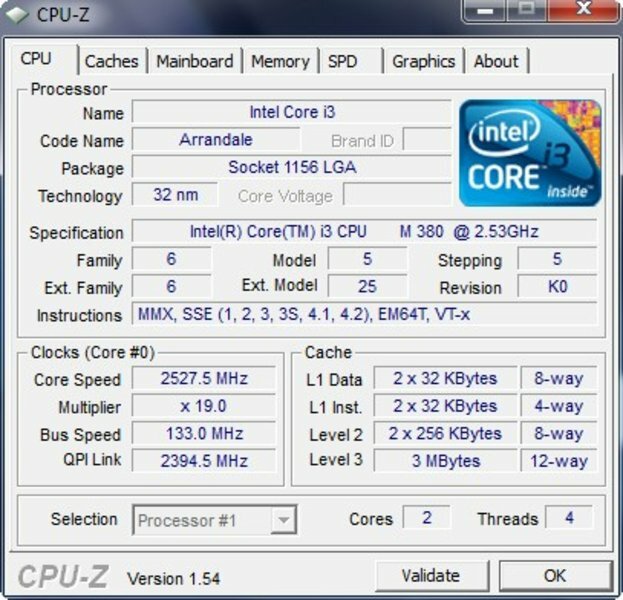 The dual-core i3-380M with 3 MB L3-cache (Intel Smart Cache) and a clock rate of 2.53 GHz is the fastest Core i3 of the Arrandale architecture. Unlike i5/i7 CPUs, it lacks the Turbo Boost function. Hyperthreading (HT) is on board and supplements each physical core with a virtual core. The i3-380M can, therefore, process up to four threads simultaneously. 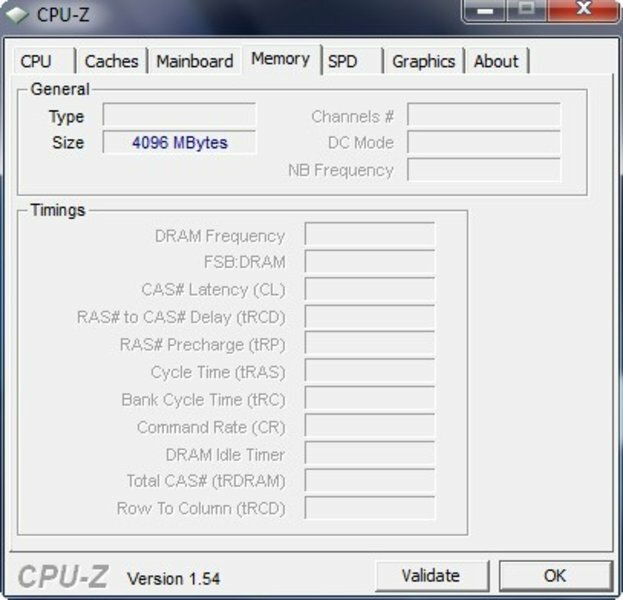 Aiding the i3-380M in its work are 4,096 MB DDR3 RAM. 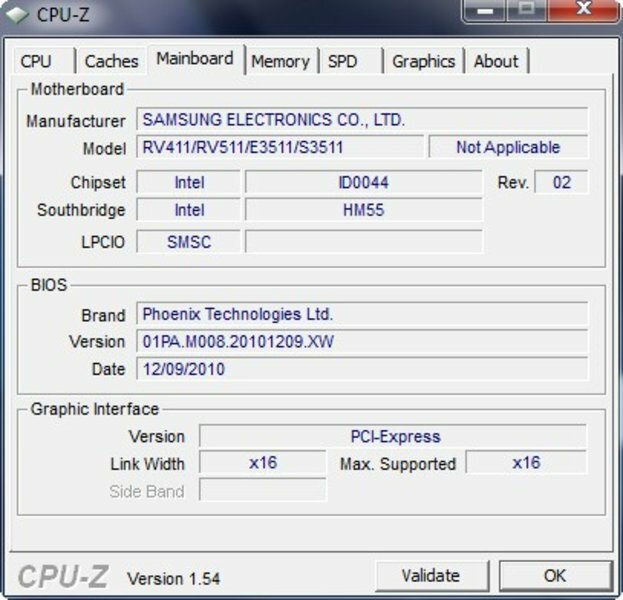 The memory controller sits directly on the CPU chip. In addition to that, we have a dedicated Nvidia GeForce 315M in place here with 1,024 MB DDR3 memory (considered an entry-level GPU by Nvidia). Nvidia Optimus is NOT on board. The GPU assists the processor in HD decoding (H.264, MPEG-2, MPEG-4 ASP - DivX or Xvid). 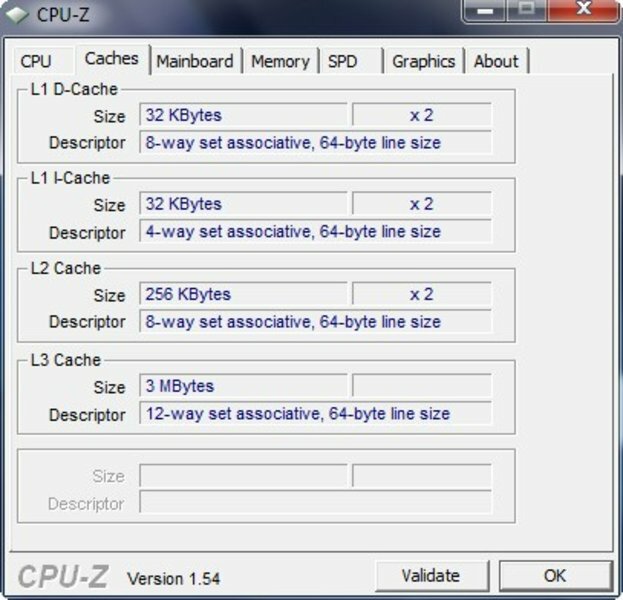 Some applications can make use of stream processing such as in video encoding (CUDA, DirectX Compute and OpenCL support). The 315M supports DirectX 10.1 but not PhysX. How fast does the Core i3-380M (2.53GHz) in our test model compute compared to the Core i5-480M (2.66GHz), which can likewise be equipped as the CPU in the RV511? In the four-thread processing test (Cinebench R11.5 64Bit), the Core i5 versions are only 3% to 4% faster. 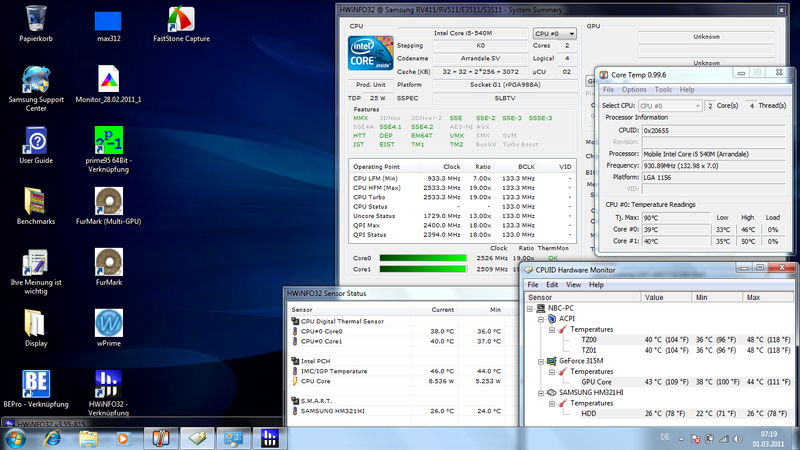 This is because of the similar base clock rate and the fact that Turbo Boost does not allow 4 x 2.9 GHz (480M). Due to the lack of Turbo Boost, our Core i3 trails far behind in the test for processing in a single core. In the Cinebench R10 Single (64bit), the 460M computes 10% faster. 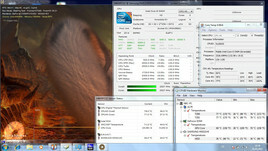 The 480M is a whole 14% faster (Turbo 2.9 GHz). Processing arithmetic is one way to compare our Core i3's application performance to that of multimedia and office laptops with a Core i5? 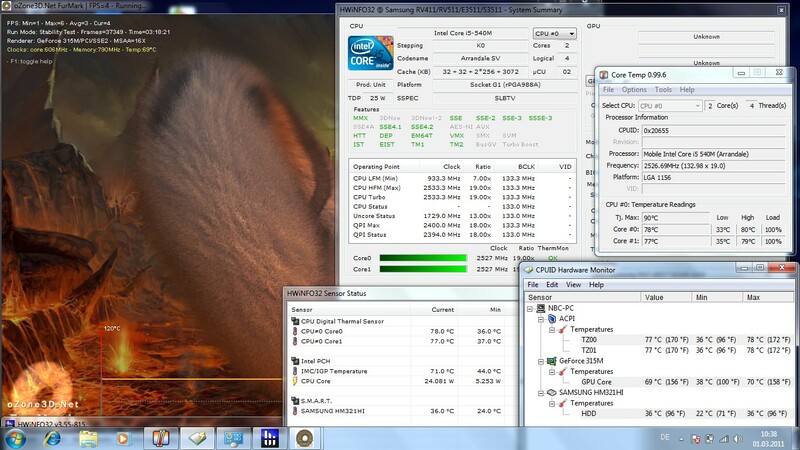 The PCMark Vantage benchmark gives our CPU's performance 5,432 points. This formidable score leaves no room for shame compared to the Core i5. 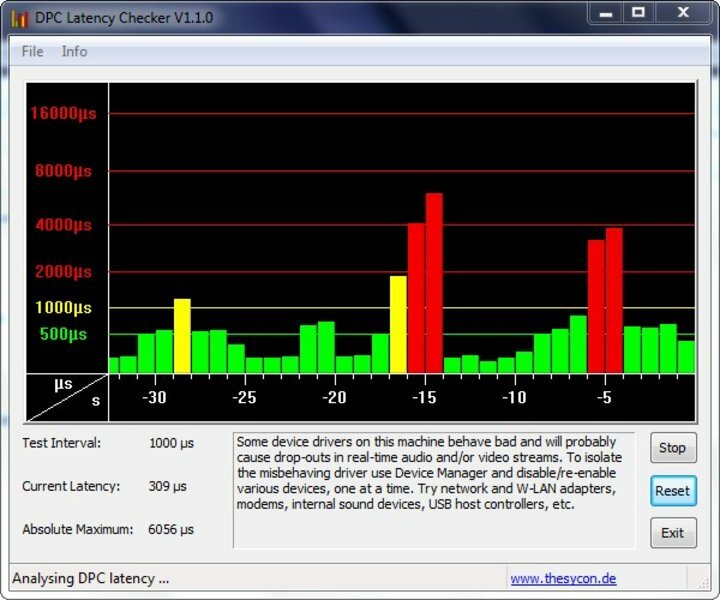 A Samsung QX310-S02DE (460M, Geforce 310M) manages only a comparable 5,660 points. The Vaio F13L8E/H (i5-480M, GT 425M) earns 6,302 points but is assisted in this feat by its more powerful GPU. On average, i5-480M systems we've reviewed manage about 5,868 points (+11%). The 80 Euro on top of the starting price for the 480M version of the RV511 is not necessarily worth it. On top of that, you'd have to go without the Geforce 315M graphics card as well. It's true, though, that this isn't much of a loss that'll go unnoticed by most users. For details on gaming performance, see the Geforce 315M Breakdown. 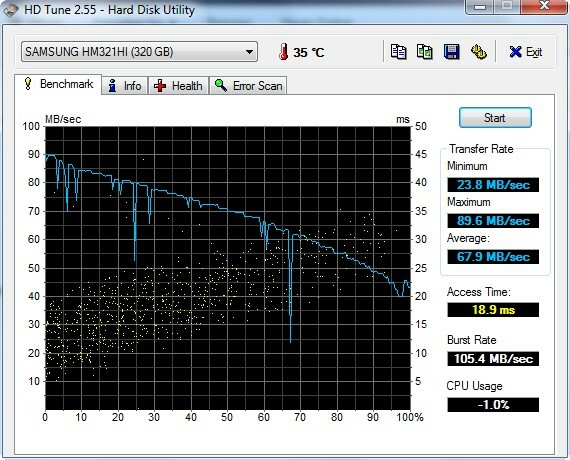 The 320 GB Samsung hard drive (HM321HI) did its part to contribute to a good overall PCMark Vantage score. 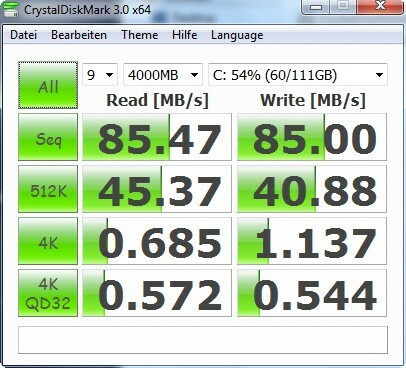 The PCMark Vantage HDD score came out to 3,240 points (about average for a 5,200 RPM HDD). The read rate was 68 MB/s (HD Tune) and the Burst Rate came to a high 105 MB/s. 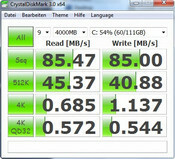 The Crystal Disk Mark 3.0 benchmark also measured a good read rate of 85 MB/s (different method than HD Tune). 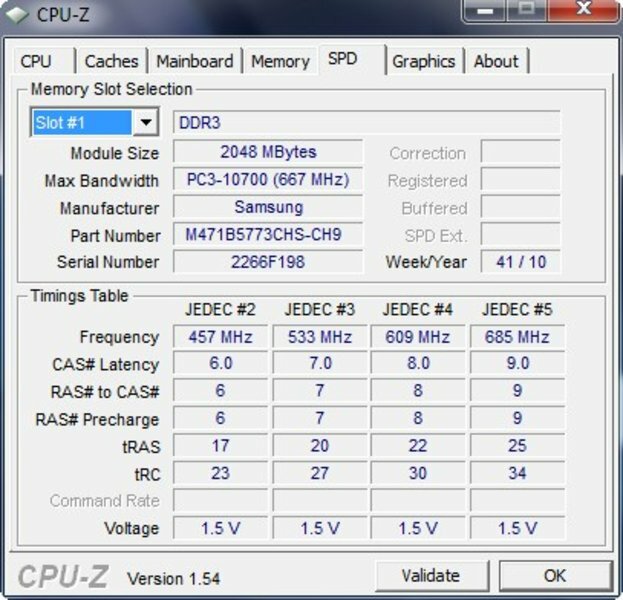 The Samsung RV511 always remains cool to the touch and stays quiet even during the stress test. The Silent Mode (Fn+F8) is meant for scrupulous office workers trying to keep the noise level to a minimum. When activated, the Silent mode keeps the noise level down when using Word, Excel, Mail or browsing the web. Short bouts of CPU stress don't get the fans going either. Only after prolonged CPU stress, like in the stress test, do the fans start whirring away in Silent Mode. Even then, the noise level never exceeds 32.7 dB(A). 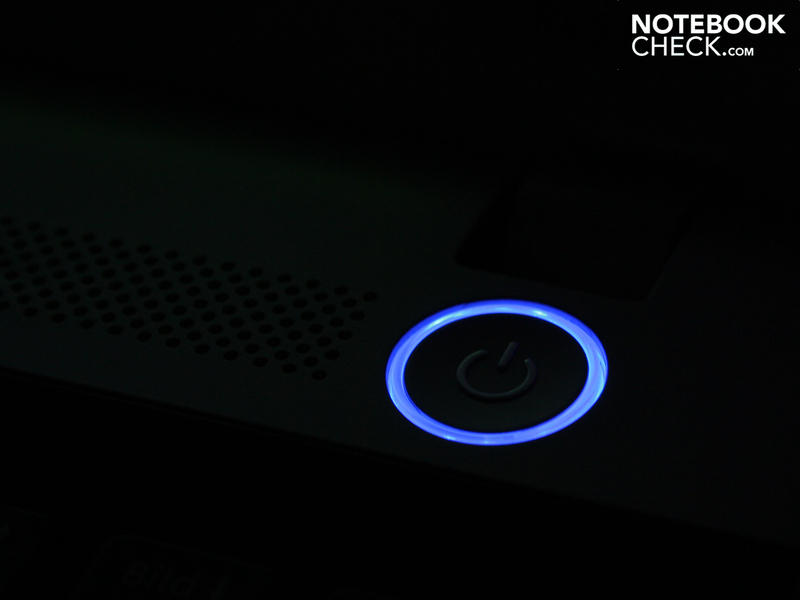 The Silent Mode brings you peace and quiet at the cost of CPU power. The clock rate of Core i3 processors drops to 1.06 GHz in Silent Mode (when processing four threads). 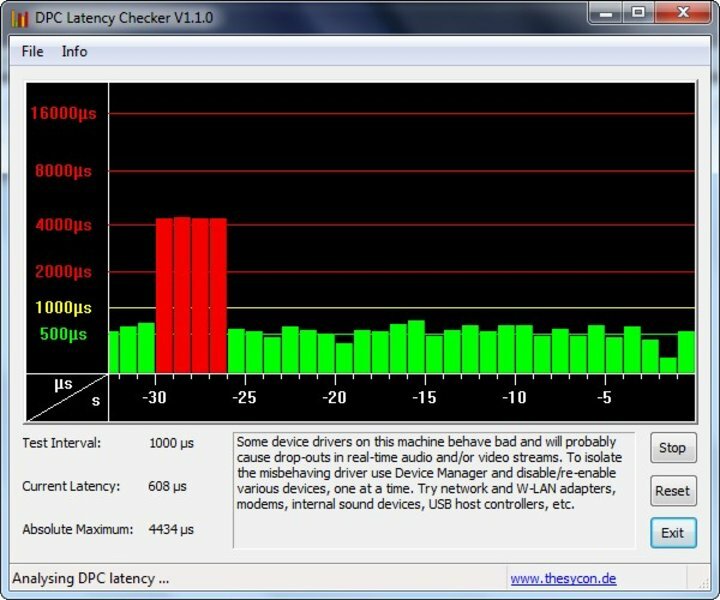 Even in Silent Mode, there's still the gentle hum of the hard drive which only reaches an almost inaudible 30.8 dB(A). While browsing the internet or other simple activities, the case never even becomes warm to the touch (graphics card idle, measured in Silent Mode). During the two-hour-long stress test—with the processor and graphics card at maximum load—the temperature only changes in several spots along the heat pipe. After two hours of the stress test (Furmark und Prime95), the average temperature on the top and bottom of the base unit dropped by 2 to 3 degrees. Did we measure this wrong? Nope, The idle temperature was measured in Silent Mode, that is, while heat was building up and the fans remained inactive. In normal mode, during the stress test, warm exhaust is quickly propelled out of the case. On top of that, the room temperature was lower during the stress test. 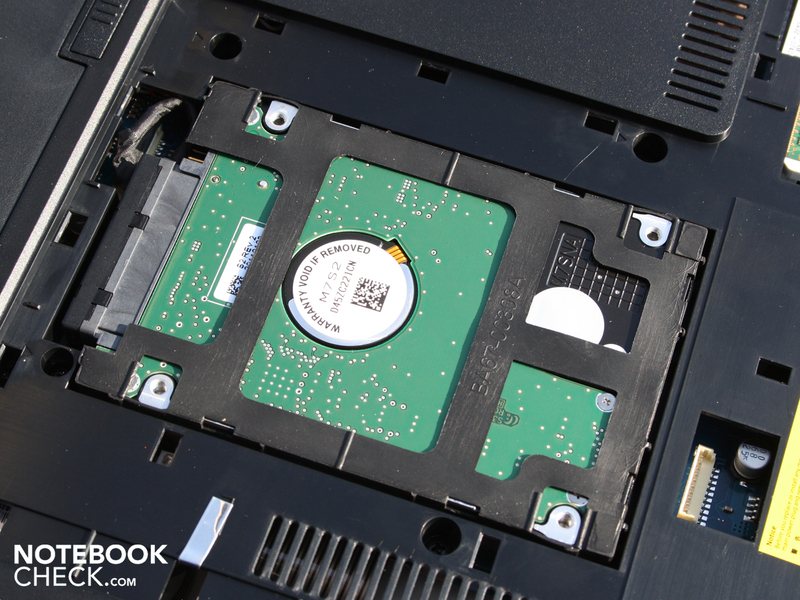 The sensors in the motherboard report the CPU maximum temperature as 80ºC. All in all, the RV511 handles heat very efficiently. (+) The average temperature for the upper side under maximal load is 24.9 °C / 77 F, compared to the average of 30.9 °C / 88 F for the devices in the class Multimedia. (+) The maximum temperature on the upper side is 31.8 °C / 89 F, compared to the average of 36.5 °C / 98 F, ranging from 21.1 to 71 °C for the class Multimedia. (+) In idle usage, the average temperature for the upper side is 27.4 °C / 81 F, compared to the device average of 30.9 °C / 88 F.
(+) The palmrests and touchpad are cooler than skin temperature with a maximum of 30.5 °C / 86.9 F and are therefore cool to the touch. (±) The average temperature of the palmrest area of similar devices was 29.1 °C / 84.4 F (-1.4 °C / -2.5 F). The speakers located above the keyboard will not satisfy those with "refined" ears. If this is the case for you, just grab a pair of headphones or hook up some external speakers because the sound produced overemphasizes the mids and becomes distorted at max volume. The maximum volume is, however, fair for a 15.6" laptop. 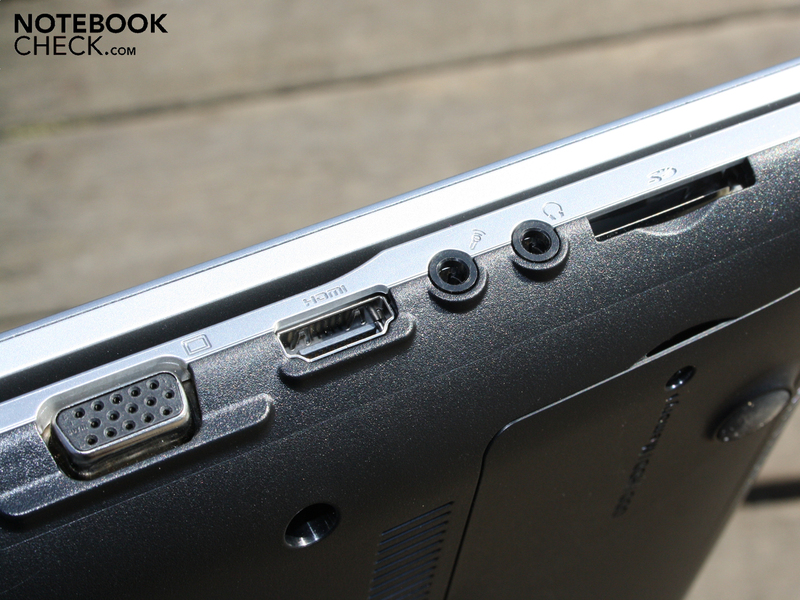 For attaching external speakers, there's only the one headphone jack at the side of the notebook. 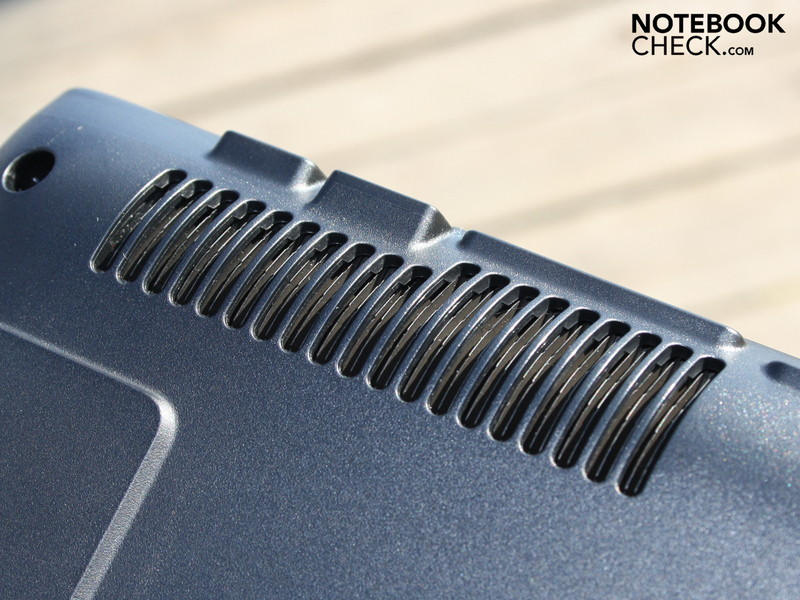 The audio signal from the notebook to external speakers produces clear, undistorted sound (audio test – no measurements). The relatively low capacity of 4,400 mAh (48 Wh) leads you to believe the battery life can't be long. The actual results for the RV511 turn out to be rather decent, though. About 3 hours (172 minutes) when browsing the internet (Wifi test). A moderate screen brightness of 100 cd/m² was used in this test. 128 minutes is how long it takes to fully charge the battery. After this, we performed the put in a DVD film, which we were able to watch for 2 hours 49 minutes on battery power. The maximum battery life (idle) is 5 hours 12 minutes. Under CPU stress, the battery life dwindles down to 83 minutes (BatteryEater Classic Test). For a better battery life (equal battery capacity) in the same price range, you might want to check out the Aspire 5253 with AMD Fusion APU (about 5 hours browsing internet with wifi). The performance of the Aspire is, however, significantly weaker. The RV511 seems very energy-efficient at first glance but it's really just on par with other Core i3 15.6" systems with a weak dedicated graphics card. 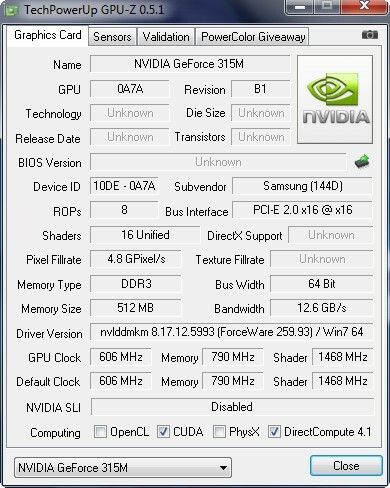 Without Nvidia Optimus, the Geforce 315M never shuts off (with the on-board GPU taking over) as it does in the RV511's sister model, the RC510. In idle mode with all energy-saving settings on (including Silent Mode, min screen brightness), the notebook eats up 12 watts (RC510 Optimus: 9.8 watts.) A more realistic measurement would be 15 watts in idle mode ("Balanced" profile, Silent Mode Off). 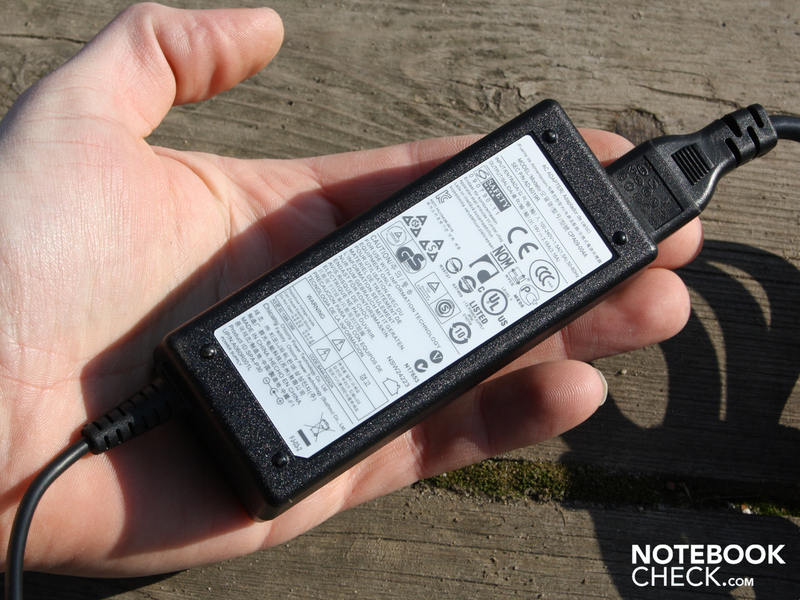 Without charging the battery, the power consumption while performing typical office tasks is between 20 and 30 watts. During the stress test, we measured the energy consumption at 63.5 watts. The small power supply (254 grams) seems overwhelmed by this, but only heats up to 48ºC. 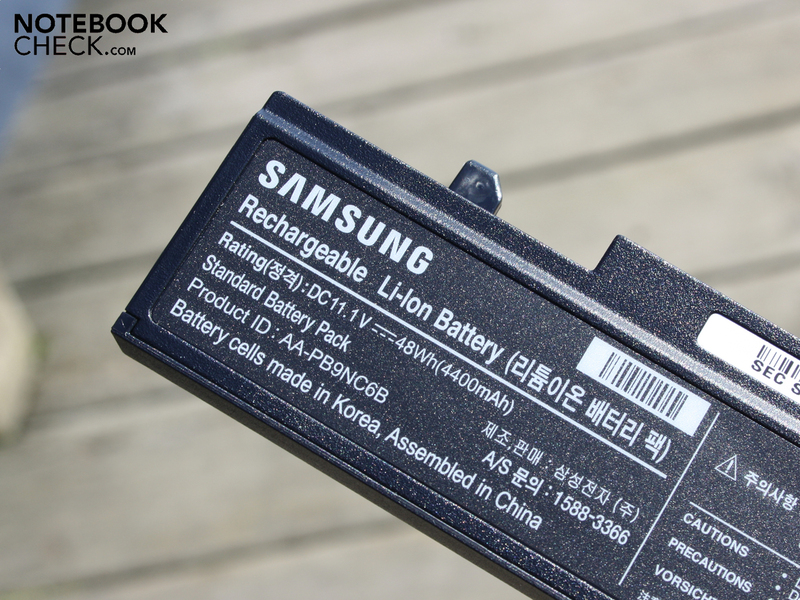 Since the battery stops being charged in case of very high energy consumption, the power supply cannot be overloaded. During the 3DMarks06 benchmark, the energy consumption rises to no more than 40 watts. When only the CPU is at full load, the laptop eats up 54 watts of energy. With Silent Mode on, the level drops to 45 watts (CPU throttling: 1.064 MHz). 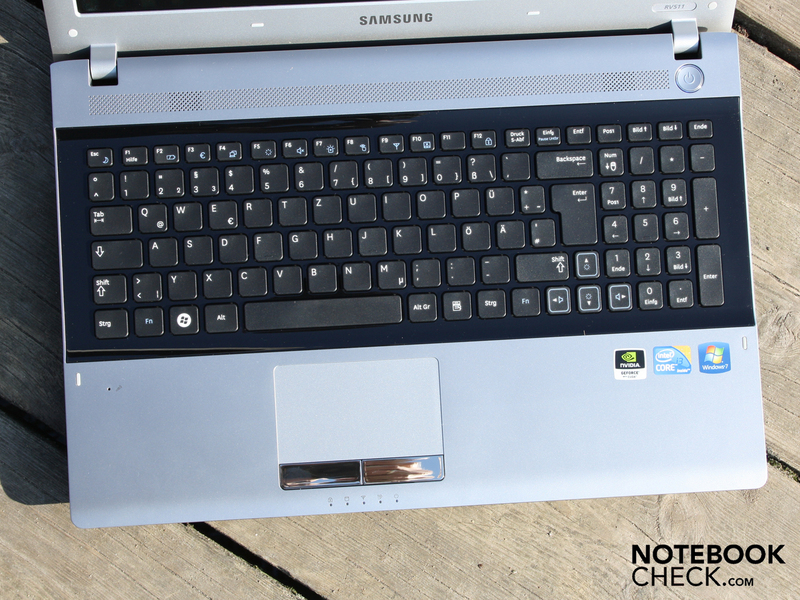 The Samsung RV511 (NP-RV511-S02DE) represents a good office notebook with some weak points and a not-very-sturdy case. 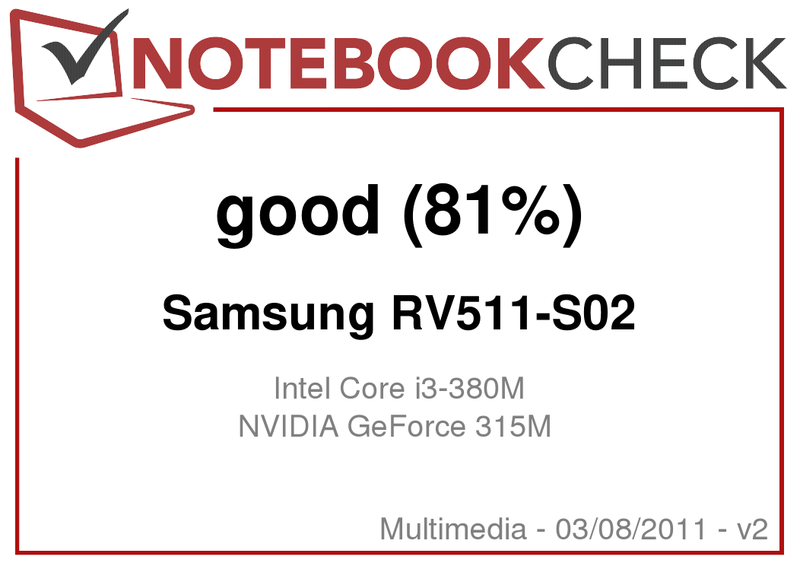 Mostly the weak Core i3-380M (2x2.66GHz) and NVIDIA GeForce 315M are responsible for the low performance score that kept the RV511 from receiving an overall rating of "Very Good" (88% and up = Very Good). 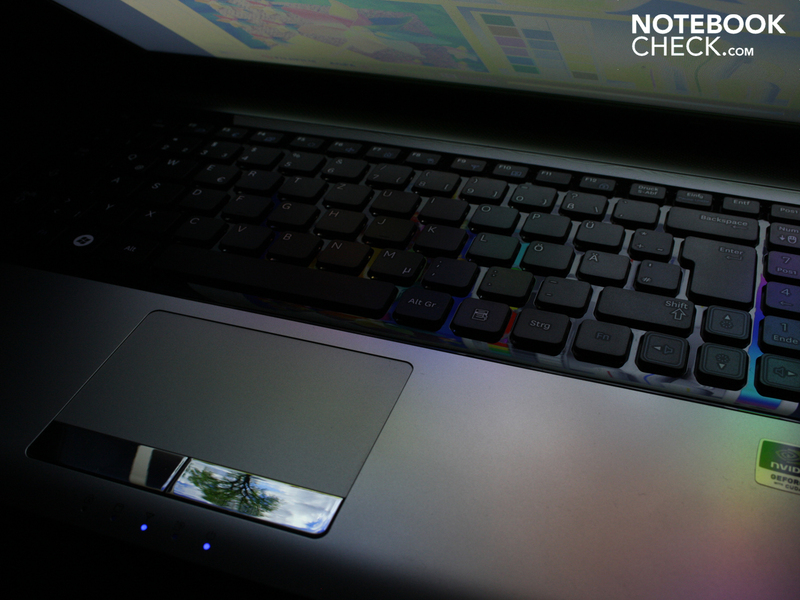 The notebook always stays cool no matter the stress on the hardware and can be kept very quiet using Silent Mode. The large, very responsive touchpad is supplemented well by the comfortable keyboard. 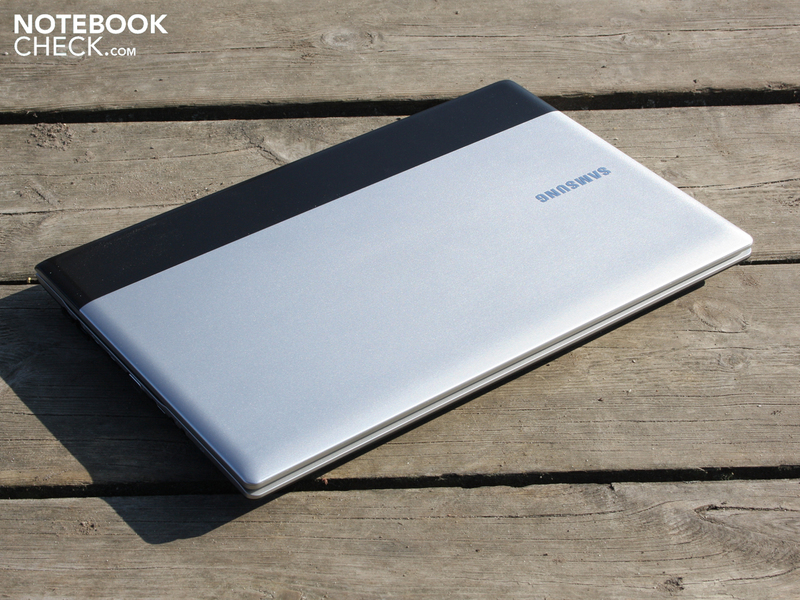 The matte display and the 3-hour battery life make for a well-rounded notebook. The high-gloss surface encompassing the keyboard can be seen as a downside since it looks a bit too flashy for the office. Moreover, fingerprint marks collect here and make it hard to recognize the keys in dimly lit rooms. If you can come to terms with the easy warping of the case in some places and place a high value on comfortable use and good application performance, you'll find what you need in the 15.6" RV511 (NP-RV511-S02DE). If you can go without the dedicated graphics card, you might want to pay the lower 440 Euro for the otherwise identical RV511-A02DE. 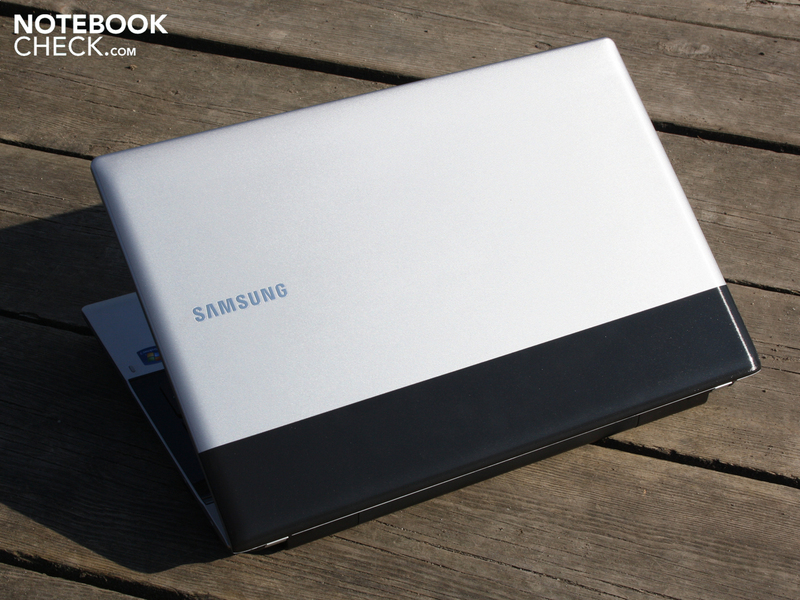 Samsung RV511 Core i3-380M: Comfortable notebook with good input devices and matte screen. Starter notebook that can do it all? No ports at the back (display lid hinges). The base plate contains a hatch leading to the hardware. Underneath you'll find the 320 GB Hitachi HDD. ...and it remains almost inaudible. There's two slots for the DDR3 RAM. The battery keeps the RV511 going for 3 hours (WiFi test). The battery's capacity of 4,400 mAh is really low. The small 254-gram power supply is quite light. 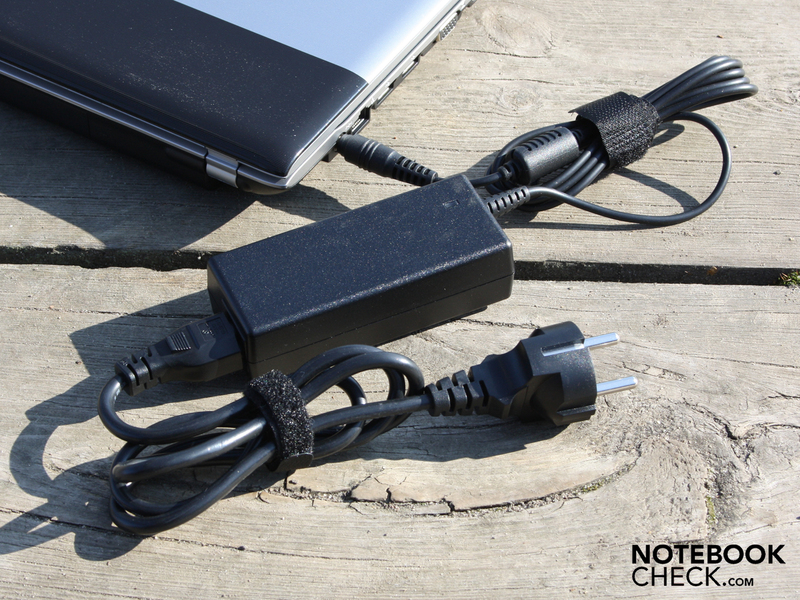 It provides the laptop with up to 60 watts and connects at the left. The right side only contains a USB port and nothing else. Besides HDMI, VGA and 3 USBs, there's little else. The variety of ports is reduced to the bare minimum in the RV511. That's what the Samsung RV511 claims to be. ...this 15.6" lapotp is supposed to be the ideal omnitool for the average joe. but scratches quickly pop up on surfaces with a silver finish. The area around the keyboard keys shines with a glossy veneer. The keys are hard to make out in dimly lit rooms. 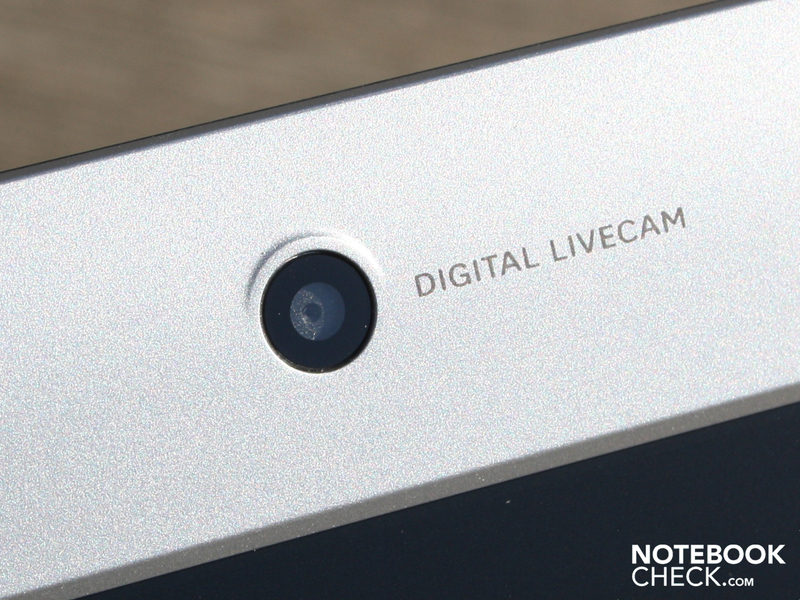 The touchpad doesn't completely manage to hide fingerprint marks. Smudges easily show up on the shiny chrome keys. Subtle detail: the power button glows rather weakly. 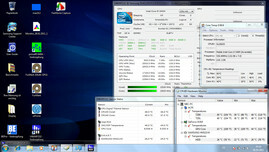 ...for Windows 7 Home Premium 64 Bit. The matte LCD screen and the once again successful Silent Mode. 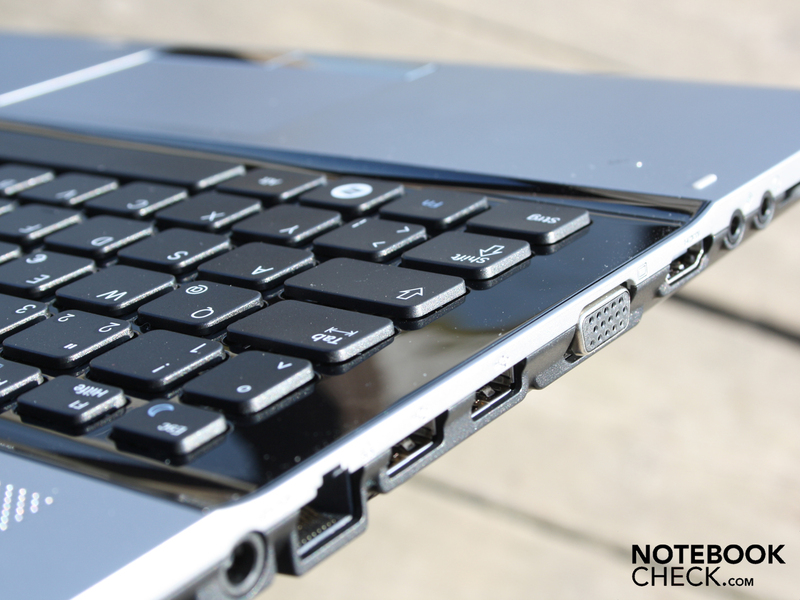 A sturdier case and non-reflective keyboard surface. A 3-hour battery with the dedicated GPU always running.